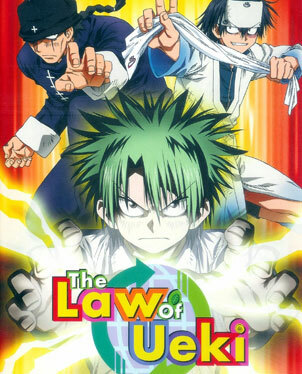 The conclusion of the series "The Law of Ueki" will be in limbo. It was an announcement that shook up the anime industry for the foreseeable future. "ADV Films, the No. 1 producer-distributor of anime outside of Japan, today confirmed that it has withdrawn plans to distribute Geneon Entertainment's DVDs, CDs and other products in North America," an ADV press release issued Sept. 21 noted. The collapse of the ADV-Geneon deal, in which ADV would have taken over the marketing, sales and distribution of the entire Geneon catalog of anime properties, pretty much spelled the end of Geneon as anime fans had known it. After 14 years of selling fan-favorite series including "Cardcaptor Sakura," "Fushigi Yuugi," "Love Hina," "Sailor Moon" and "Samurai Champloo" in the United States, the company stopped distributing its products earlier this month. While there was some advance notice that Geneon would be withdrawing from the U.S. market, there still wasn't enough time for the company to complete work on several series the company was adapting for American audiences at the time. Those series now run the risk of never being completed unless another company rescues them from limbo. A sampling of these now-suspended series showcases just why Geneon will be missed in the anime industry: The company had a knack for licensing series that might not have sold as many copies as more heavily promoted series but were solid viewing choices nonetheless. The martial arts tournament is one of those anime staples that, when done properly, can entertain for a good chunk of episodes. Put a bunch of people with varying skills and talents together and let them have at it, and a series could stretch for months. In "Law of Ueki," 100 candidates vying for the position of Celestial King each pick a junior high student to whom they give a certain power. The winning candidate's student also receives the "talent of blank," with which they can get whatever they desire. Mr. Kobayashi, one of the candidates, picks Kosuke Ueki, a boy who appears to be somewhat lackadaisical on the surface but who really has a strong sense of justice and righteousness. The real hook of this series lies in the unconventional powers the candidates grant. Ueki gains the power to turn trash into trees; other students can perform feats such as spitting out fireballs after drinking water, forming metal spikes from cotton balls or transforming electricity into sugar. Yet there's quite a bit at stake for the combatants. A knockout loss results in the loss of their powers. If they use their powers to injure someone who isn't part of the tournament, they stand to lose one of their natural "talents." Losing all their talents results in the person disappearing from existence. Even with the gimmick of unusual powers, this series might end up feeling repetitive to some. But for audiences in their early to midteens, the episodes that were released might be entertaining enough to overcome the fact that they won't know what happens at the end. The manga series on which the anime was based is still being released stateside by Viz, though, so that might ease the pain somewhat. The name Abe no Seimei has somewhat of a divine nature attached to it -- fitting, perhaps, since he was considered the premier "onmyouji," or mystic, in 10th-century Japan. In "Shonen Onmyouji," his grandson, Abe no Masahiro, follows in Seimei's footsteps ... albeit somewhat reluctantly at first, and with the help of a token cute sidekick character. That would be the creature that Masahiro dubs Mokkun. This creature is actually quite powerful, once serving as Seimei's guardian in human form as Guren, the Crimson Lotus ... or maybe his name's really Touda, a Land Spirit on the Globe of the Five Justices. The whole issue is rather confusing at the outset. Not helping matters is the translation, which suffers at times from being inaccessible to the casual viewer. Words like "shikigami," onmyouji, "mononoke" and "ayakashi" are casually dropped into the dialogue without any explanation of what they mean in the vocabulary of Japanese myth. A glossary of terms included on the DVD or in an insert definitely would have helped. Semantics aside, the 10 episodes released reveal a show that was slowly developing into a fun romp through Japanese folklore. Masahiro and Mokkun/ Guren/Touda meet head-on the "disaster that will soon befall men" foreseen by Seimei, battling some demons and chatting with other, smaller ones that are actually kind of cute. At the same time, Masahiro gradually matures from a hotheaded young teen to someone who just might escape the label of "Seimei's grandson" that he so loathes. The potential is certainly there for a good product, one that entertains as well as educates about Japanese tradition. All that's needed is for the right company to pick it up. The classic saying about looks being deceiving rings true on several levels with this series, which feels at times like it's going to be a lighthearted high school romp with undertones of romance yet turns much darker as it goes along. Keiichi, a new arrival to the sleepy village of Hinamizawa, has already made several friends in the month he's lived there. Rena Ryuga appears to be the good girl who always waits for Keiichi to walk with him to school; Mion Sonozaki is the energetic go-getter leader; Rika Furude is the quiet, shy one; and Satoko Hojo plays the ultra-über-competitive member of the group. And yet, there's something that just feels ... off about the whole situation. There's an flashback sequence that kicks off the series, showing a boy beating the blood out of a victim. There's also the matter of a controversial dam project near Hinamizawa and how it was halted after one of the workers was found hacked to pieces. And then there's the curse of the Cotton Drifting Festival, during which someone has died a gruesome death every year. Yet whenever Keiichi talks to any of the girls about it, their behavior turns ice cold. In fact, the closer he gets to uncovering the truth, the more intent the girls seem to want to get rid of him. And they know everything about Keiichi ... or so it seems to him, anyway. As it turns out, none of the events that take place or the people involved in them are exactly as they seem. Therein lies the beauty of this series' nonlinear story: Just when viewers think they have a handle on what's going on, events reset and go down a slightly different path that makes one question the conclusions that were made before. What is clear is that something is going on in Hinamizawa; figuring exactly what takes not only all 26 episodes of this series, but a follow-up series, "Higurashi No Naku Koro Ni Kai," as well. Unfortunately, Geneon managed to release only 14 episodes. Unless another company takes a chance on it, there's no way of knowing how the mysteries resolve. With the promise this series shows, that could be the greatest tragedy of all.